ذادق آبادی, احمد, ملکوتی, حسین, محمدی, علی. (1396). توسعه پارامترسازی طول زبری در لایه سطحی جو- اقیانوس بر اساس داده‌های اندازه‌گیری. مجله ژئوفیزیک ایران, 11(4), 107-122. احمد ذادق آبادی; حسین ملکوتی; علی محمدی. "توسعه پارامترسازی طول زبری در لایه سطحی جو- اقیانوس بر اساس داده‌های اندازه‌گیری". 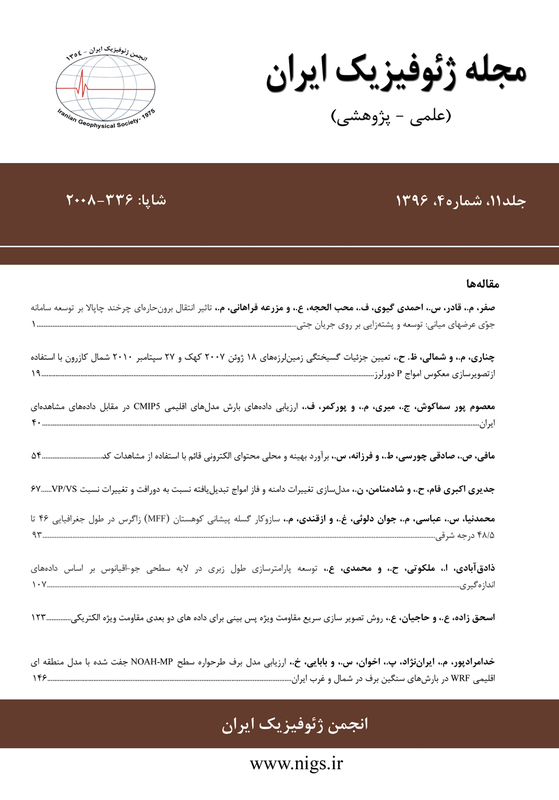 مجله ژئوفیزیک ایران, 11, 4, 1396, 107-122. ذادق آبادی, احمد, ملکوتی, حسین, محمدی, علی. (1396). 'توسعه پارامترسازی طول زبری در لایه سطحی جو- اقیانوس بر اساس داده‌های اندازه‌گیری', مجله ژئوفیزیک ایران, 11(4), pp. 107-122. ذادق آبادی, احمد, ملکوتی, حسین, محمدی, علی. توسعه پارامترسازی طول زبری در لایه سطحی جو- اقیانوس بر اساس داده‌های اندازه‌گیری. مجله ژئوفیزیک ایران, 1396; 11(4): 107-122. رفتار ضریب پَسار با افزایش سرعت باد نقش تعیین‌کننده‌ای در تبادلات سطحی ایفا می‌کند. تحقیقات صورت گرفته در دهه اخیر نشان می‌دهد روی محیط دریایی در شرایطی که سرعت باد تراز 10 متر از آستانه 30 متر بر ثانیه بیشتر می‌شود، ضریب پَسار کاهش یافته یا حداقل ثابت باقی می‌ماند. به‌منظور پارامترسازی درست ضریب پَسار، امروزه از داده‌های تجربی برای برازش رابطه ارتفاع زبری استفاده می‌شود که از این بین می‌توان تحقیقات جامع ادسون و همکاران (2013) را نام برد. آنها با استفاده از مقادیر اندازه‌گیری شده سرعت اصطکاکی و ارتفاع زبری، رابطه‌ای خطی برای ضریب چارنوک (ضریب جمله توان دوم سرعت اصطکاکی در رابطه چارنوک) ارائه نمودند. به دلیل استفاده از کلیه اطلاعات اندازه‌گیری شده در محاسبه ارتفاع زبری، رابطه ضریب چارنوک برازش داده شده از دقت خوبی برخوردار است. در این پژوهش از یک برازش مرتبه دوم تا سرعت 30 متر بر ثانیه بر روی داده‌های اندازه‌گیری شده ادسون و همکاران استفاده شد. این برازش موجب شد که بازه اندازه‌گیری شده سرعت باد از 7 تا 18 متر بر ثانیه در ادسون و همکاران (2013) به 5 تا 23 متر بر ثانیه در این پژوهش افزایش یابد. به‌منظور شبیه‌سازی کاهش یا ثابت باقی ماندن ضریب پَسار در سرعت‌های بالاتر از 30 متر بر ثانیه از یک برازش خطی کاهشی در این بازه از سرعت باد استفاده شده است. برازش خطی کاهشی به‌گونه‌ای که در سرعت 90 متر بر ثانیه ضریب چارنوک صفر می‌شود. از نتایج مهم پژوهش حاضر این است که افزایش سریع ضریب چارنوک در سرعت‌های باد بیشتر از 30 متر بر ثانیه مهار شده و روند افزایش ضریب پَسار با سایر تحقیقات منطبق شده است. در واقع در این پژوهش، نقص عمده روش ادسون و همکاران (2013) در سرعت‌های بالای باد برطرف شده است. Charnock scheme is known as the most widely used method to calculate the flux exchange in the ocean surface layer. Due to the simplicity of the application and run with minimum meteorological data, it is one of the most popular schemes in the surface layer. Edson et al. (2013) introduced the method of variable coefficients for the Charnock relationship and used data collected from four oceanic field experiments for this purpose. They have introduced a linear regression equation among neutral wind speeds at 10 m (U10N) in range of 7 to 18 m/s with coefficients of Charnock relation. This proposed linear equation is considered by the investigators in the recent versions of 3.8 and 3.9 of the WRF model and is evaluated in some cases. This scheme is considered as the default for the calculation of surface fluxes. The applicability of this method only for U10N between 7 and 18 m/s is known as a disadvantage of this scheme. In this study, the aforementioned problem (U10N limitation) was considered, and neutral wind velocity at 10 m was fitted measured data of Edson in a range of 5 to 30 m/s by a second-order function. However, the average error in second-order fitness has slightly increased, but considering speeds of 18 to 30 m/s can cover a slight decrease in fitness accuracy. For U10N higher than 30 m/s, according to a large number of studies in the field of reducing or fixed drag coefficients at speeds above 30 m/s, the assumption of reducing the Charnock coefficient was studied for U10N more than 30 m/s. The Charnock coefficient was assumed at U10N higher than 30 m/s would decrease linearly with increasing wind speed and eventually reach zero at 90 m/s. Due to the lack of physical interpretation for zeroing the Charnock coefficient at 90 m/s, the maximum U10N of 80 m/s is considered, which is equal to 0.005 for the value of the Charnock coefficient. Modification of the Edson et al. (2013) scheme in this paper has led to a reduction in the growth rate of the drag coefficient. The main results of the present research are that even with zeroing the Charnock coefficient at 90 m/s and taking into account the maximum U10N at 80 m/s in the Edson et al. scheme, the reduction in drag coefficient at U10N more than 30 m/s cannot be created. Therefore, if future measurements suggest additional flux production at U10N higher than 30 m/s for the Edson et al. scheme, stronger strikes are needed to reduce roughness length, and the decreasing trend does not occur in the drag coefficient even with zeroing the Charnock coefficient. Therefore, it is seen that adding ocean spray effects to well-known schemas such as Charnock has many problems. In this study, although the main defects of the Edson et al. scheme (Quasi-exponential growth of the drag coefficient with increasing wind speed) have been resolved, more field measurements will be required for the scheme verification proposed in this paper. Andreae, M. O., Rosenfeld, D., 2008, Aerosol–cloud–precipitation interactions. Part 1. The nature and sources of cloud-active aerosols: Earth-Science Reviews, 89, 13-41. Andreas, E., 1996. The temperature of evaporating sea spray droplets. Oceanographic Literature Review 1(43), p.14. Andreas, E.L., 2004, Spray stress revisited: Journal of Physical Oceanography, 34, 1429-1440. Andreas, E.L., Emanuel, K.A., 2001, Effects of sea spray on tropical cyclone intensity: Journal of the Atmospheric Sciences, 58, 3741-3751. Andreas, E. L., Mahrt, L., Vickers, D., 2012, A new drag relation for aerodynamically rough flow over the ocean: Journal of the Atmospheric Sciences, 69, 2520-2537. Andreas, E. L., Mahrt, L., Vickers, D., 2015, An improved bulk air–sea surface flux algorithm, including spray‐mediated transfer: Quarterly Journal of the Royal Meteorological Society, 141, 642-654. Bianco, L., Bao, J.-W., Fairall, C., Michelson, S., 2011, Impact of sea-spray on the atmospheric surface layer: Boundary-layer meteorology, 140, 361-381. Charnock, H., 1955, Wind stress on a water surface: Quarterly Journal of the Royal Meteorological Society, 81, 639-640. Davis, C., Wang, W., Chen, S.S., Chen, Y., Corbosiero, K., DeMaria, M., Dudhia, J., Holland, G., Klemp, J., Michalakes, J., 2008, Prediction of landfalling hurricanes with the advanced hurricane WRF model: Monthly Weather Review, 136, 1990-2005. DeCosmo, J., Katsaros, K., Smith, S., Anderson, R., Oost, W., Bumke, K., Chadwick, H., 1996, Air‐sea exchange of water vapor and sensible heat: The humidity exchange over the sea (HEXOS) results: Journal of Geophysical Research: Oceans, 101, 12001-12016. Donelan, M., Haus, B., Reul, N., Plant, W., Stiassnie, M., Graber, H., Brown, O., Saltzman, E., 2004, On the limiting aerodynamic roughness of the ocean in very strong winds: Geophysical Research Letters, 31. Zou, Z., Zhao, D., Liu, B., Zhang, J.A. and Huang, J., 2017. Observation‐based parameterization of air‐sea fluxes in terms of wind speed and atmospheric stability under low‐to‐moderate wind conditions. Journal of Geophysical Research: Oceans, 122(5), pp.4123-4142. Drennan, W.M., Graber, H.C., Hauser, D., Quentin, C., 2003, On the wave age dependence of wind stress over pure wind seas: Journal of Geophysical Research: Oceans, 108. Drennan, W. M., Zhang, J. A., French, J. R., McCormick, C., Black, P. G., 2007, Turbulent fluxes in the hurricane boundary layer. Part II: Latent heat flux: Journal of the Atmospheric Sciences, 64, 1103-1115. Edson, J. B., Jampana, V., Weller, R. A., Bigorre, S. P., Plueddemann, A. J., Fairall, C. W., Miller, S. D., Mahrt, L., Vickers, D., Hersbach, H., 2013, On the exchange of momentum over the open ocean: Journal of Physical Oceanography, 43, 1589-1610. Garratt, J., 1992. The atmospheric boundary layer, Cambridge atmospheric and space science series. Cambridge University Press, Cambridge 416, 444. Grachev, A., Fairall, C., Hare, J., Edson, J., Miller, S., 2003, Wind stress vector over ocean waves: Journal of Physical Oceanography, 33, 2408-2429. Guan, C., Xie, L., 2004, On the linear parameterization of drag coefficient over sea surface: Journal of Physical Oceanography, 34, 2847-2851. Kara, A. B., Hurlburt, H. E., Wallcraft, A. J., 2005, Stability-dependent exchange coefficients for air–sea fluxes: Journal of Atmospheric and Oceanic Technology, 22, 1080-1094. Large, W., Pond, S., 1982, Sensible and latent heat flux measurements over the ocean: Journal of Physical Oceanography, 12, 464-482. Liu, B., Guan, C., Xie, L., 2012, The wave state and sea spray related parameterization of wind stress applicable from low to extreme winds: Journal of Geophysical Research: Oceans, 117(C11). Liu, W. T., Katsaros, K. B., Businger, J. A., 1979, Bulk parameterization of air-sea exchanges of heat and water vapor including the molecular constraints at the interface: Journal of the Atmospheric Sciences, 36, 1722-1735. MacIntyre, F., 1972, Flow patterns in breaking bubbles: Journal of Geophysical Research, 77, 5211-5228. Makin, V. K., 2005, A note on the drag of the sea surface at hurricane winds: Boundary-Layer Meteorology, 115, 169-176. Monin, A., Yaglom, A., 1971, Statistical Fluid Dynamics. Vol. I and II MIT Press, Cambridge. Paulson, C. A., 1970, The mathematical representation of wind speed and temperature profiles in the unstable atmospheric surface layer: Journal of Applied Meteorology, 9, 857-861. Peña, A. and Gryning, S.E., 2008, Charnock’s roughness length model and non-dimensional wind profiles over the sea. Boundary-layer meteorology, 128(2), pp.191-203.